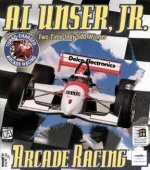 As the game title implies, Al Unser Jr. Arcade Racing is an arcade style racer for Windows starring F1 racer of the same name. 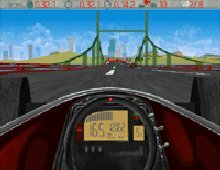 The game doesn't offer much to the simulation freak, but if you're looking for a simple race-around-a-track game with fast smooth graphics, then this might be just right for you. The controls seem to get a bit too responsive on faster computers. If you're having trouble staying on course, try a slow-down util for Windows, like Turbo. Note: This Windows game only works in 256 color mode, so make sure you reset desktop settings before starting the game.